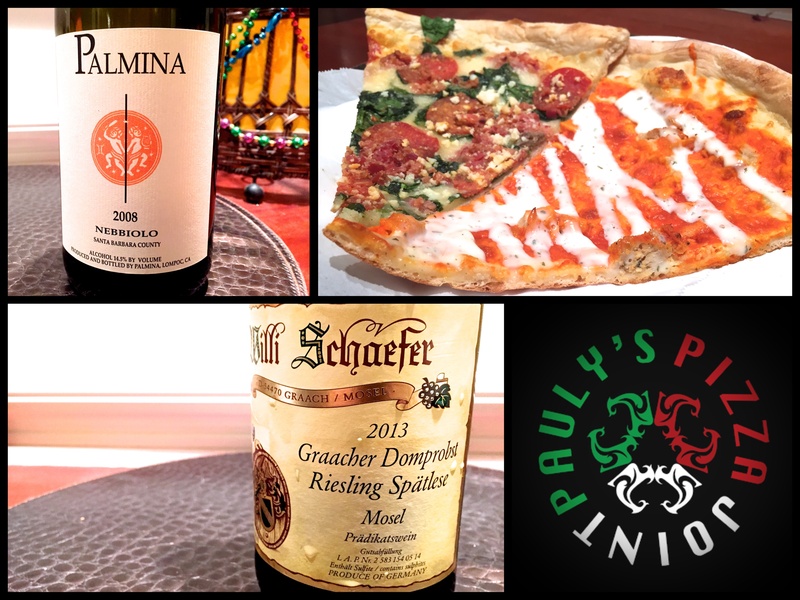 Pauly’s Pizza Joint is a quiet strip mall on the long, sunny stretch of Miramar Road churning out thin-crust pies and lots of personality. 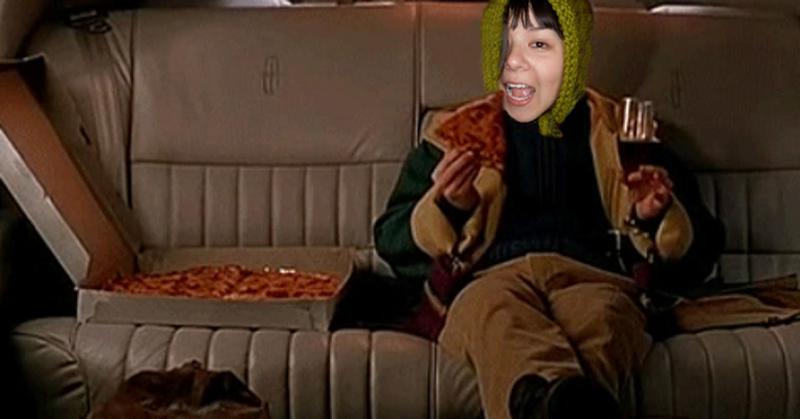 After much deliberation over the killer selection of by-the-slice, a slice of Buffalo Chicken Pizza and the House Pie (aka Christmas Pie) are squirreled back to the wine-pairing lair for intense observation. The Buffalo Chicken slice is made up simply of chicken, ranch and Frank’s RedHot hot sauce, the latter acting as sauce and dominating visual effect of the pie. With each bite, the creaminess of ranch hits first moving swiftly into the nostalgic spice of Frank’s RedHot that speaks to a long history of chicken wing indulgence. 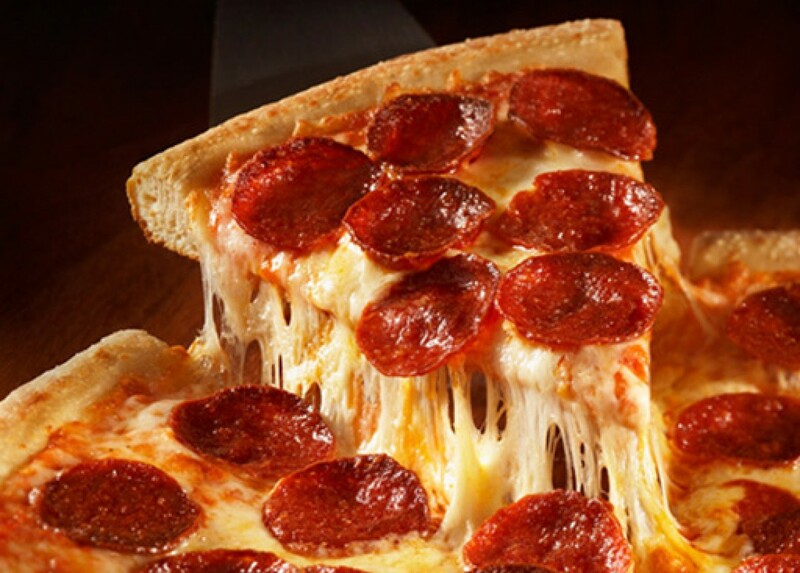 Chunks of chewy meat are scattered about while a blanket of chicken lurks below in sneaky ninja ways, emerging from the crust in places that seem populated by sauce alone. The resulting effect of this chewy, savory infusion is both delightful and addicting. Built from the American bar food classic of buffalo wings, this pizza swings well into the non-traditional realm of pies. 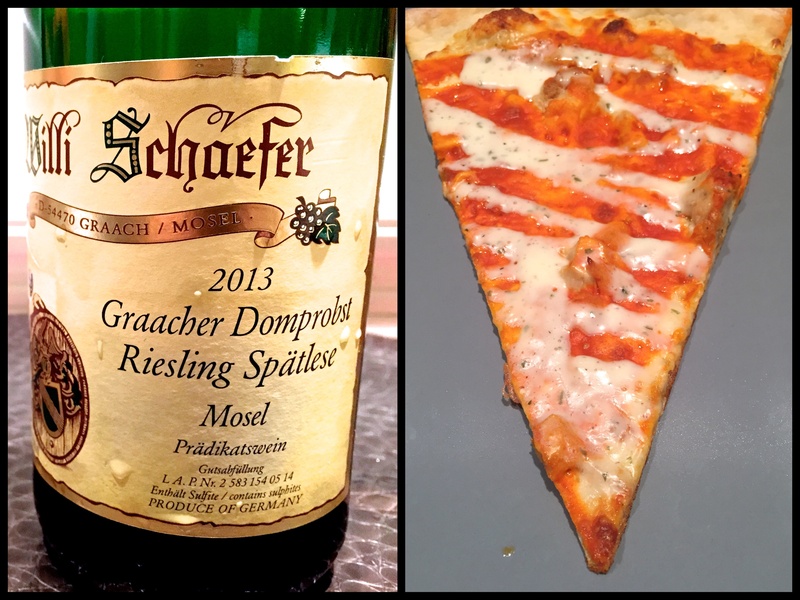 Its personality could not extend much further from its pairing, a mineral-driven, off-dry German Riesling (Willi Schaefer, Mosel, Graacher Domprobst, Spätlese, 2013). Aroma of crushed slate, pears and apple blossom offer contrasting flavors to the pie while generous acidity and residual sugar counterbalance the lingering spice and twangy vinegar of Frank’s RedHot. Every bite has you chasing the heat-relieving sip of sweetness that in itself is never overly cloying thanks to the one-two acidic punch that comes with a cool climate and varietal typicity. The House Pie comes topped with bacon, pepperoni, spinach, garlic and feta, earning its second title, “Christmas pie,” due to reports of it being Santa’s favorite off-season snack. Fresh out of the oven, the slice is immediately alluring with sizzling pork products forming seductive wafts that almost make you forget about wine. Almost. 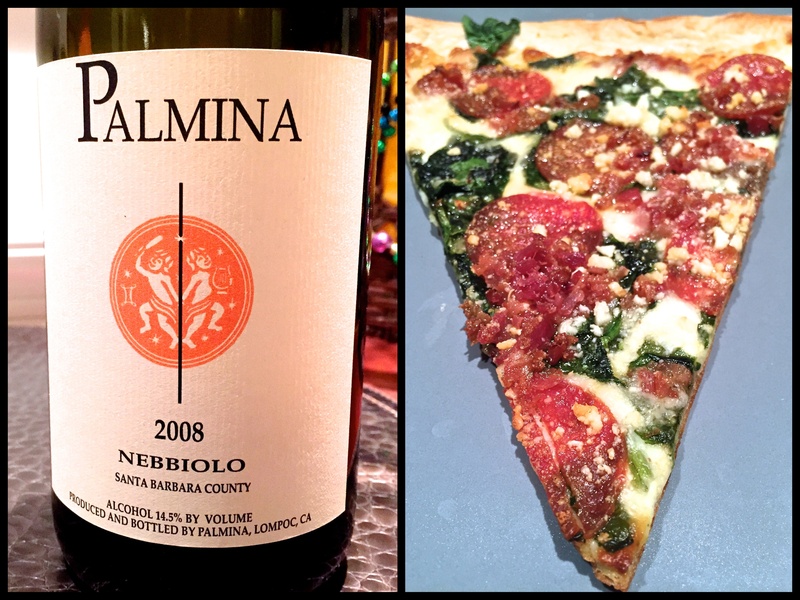 Such a hedonistic pizza requires an equally hedonistic wine: Palmina Nebbiolo (Santa Barbara County, 2008). Free from strict, tradition-driven rules that make up the viticultural framework of most Old World regions, the United States is constantly tinkering with different varietals, ranging from successful grapes of other established regions to the under-appreciated and unknown. Nebbiolo stems from the first category, already secured in its reputation as it makes up 100% of Barolo and Barbaresco, some of Italy’s finest quality wines. Palmina Nebbiolo wine expresses its Italian roots with intense red berries, violets and a gritty tannic structure. While dry, the fruit is as expressive as gummy bears, giving into its New World upbringing. The wine is so tantalizingly vigorous that even the occasional zing of pepperoni spice barks but never bites at the luscious fruit bouquet. Meanwhile, the comparatively quieter spinach cuts through all the greasy meat providing a welcomed vegetal contrast while the candied garlic mirrors the sweet oak present in the wine, which lends nutmeg and vanilla bean to the finish.